If your children are getting into their grade school years and starting to express an interest in fishing, then you might want to plan a trip that includes them. Fishing with children is a much different experience than going on a trip with your experienced buddies, and requires proper planning and procedures. Fishing with children will require you to pay close attention to where they are at all times, and equip the boat with different safety gear. The team at FishingLicense.org encourages fishermen who are bringing their kids along on a trip to learn about their needs to keep the trip enjoyable and safe. 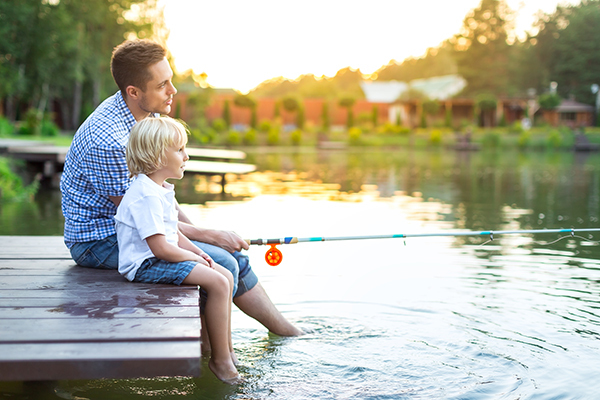 Here are a few things to think about when you’re ready to take children fishing. When fishing with children, safety will be the top priority. You’ll need to give the children a debriefing on boat safety before embarking on your trip. You may want to have them spend some time on the boat while it’s docked so they can get used to moving around the vessel. The team at FishingLicense.org reminds all boat captains that children need to have a properly fitted life vest on them at all times while on a boat. Before ever inviting a child to fish with you, be sure you have the proper safety gear, including a life vest, that will fit him or her correctly. You’ll also need to reconsider the items you have stocked in your first aid kit. While bandages, sunscreen, and ointments are still essentials to have on hand for kids, you’ll also need to add children’s painkillers and allergy medications. The adult versions of these drugs can be too strong for children to handle, and they’ll be good to keep available in case of an emergency. Small children won’t have any fun on a fishing trip if they’re subjected to using full sized fishing rods and reels. These large fishing rods are virtually impossible for tiny hands and bodies to maneuver and handle. If you’re planning to take your kids on the next fishing trip with you, invest in some junior sized fishing poles so they can learn how to use rods that are the correct size. For kids that are too small for junior poles, assisting you with your adult-sized pole might be fun for them to experience fishing. Handling their own fishing pole is out of the question for small children. Keep them busy and entertained by teaching them how to hold the adult fishing pole, with your supervision and assistance. You should also consider the bait and lures that you’re planning to use on the next trip. According to the team at FishingLicense.org, heavy bait or lures can weigh down a junior-sized fishing pole and make it hard for a child to hang on, let alone reel in an actual fish. Consider smaller, more lightweight baits if they’ll still work for the type of fish you’re targeting. You can also shop for lures that include feathers or other lightweight jigs to entice fish, without adding extra weight to the pole. Your children will have a much more enjoyable trip if they’re not getting completely worn out by a heavy, large fishing pole, with weighted bait and lures. If this is the first fishing trip you’re taking your children on, you should probably plan something as local as possible. Traveling a far distance can be disappointing because usually, kids only last a few hours out on a boat before they’re ready to come in. Staying local allows you to call it quits early if needed, without a long commute back home. The experts at FishingLicense.org also recommend visiting waters where the target fish can easily be handled by children. Targeting small fish makes it easier for children to reel them in when they have a bite. It also means smaller bait and smaller lures are needed, so the line is much lighter, and easier for small hands to maneuver and hold.